Note: This is the bound book only and does not include access to the Enhanced Pearson eText. To order the Enhanced Pearson eText packaged with a bound book, use ISBN 0134290127. A thoroughly up-to-date look at the field of social work using a unique macro practice model focused on making changes within diverse communities and organizations. 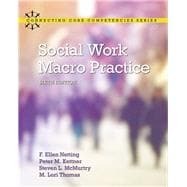 Social Work Macro Practice approaches the field of social work recognizing that all social workers must be able to engage, assess, and intervene with individuals, families, groups, organizations, and communities. It focuses on enabling social work practitioners to undertake whatever types of macro-level interventions are needed in an informed, analytical manner, confident that they can do a competent job and achieve positive results. Bringing readers up to date on the latest changes in the field, this practice-oriented edition integrates many field-based vignettes and examples throughout and elaborates a planned change model introduced in previous editions. Among the numerous updates, improvements, and new material, the new edition incorporates material on international/global content, pays special attention to the use of technology, and reinforces the role of advocacy in all aspects of social work practice. The Enhanced Pearson eText features embedded videos and assessments. F. Ellen Netting is Professor Emerita in Social Work and the former Samuel S. Wurtzel Endowed Chair at Virginia Commonwealth University (VCU) where she taught for 19 years, having previously taught 10 years at Arizona State University. Her practice experience includes directing a county office on aging, directing a foster grandparent program, serving as the trainer and program evaluator for a 16 county area agency on aging, and consulting with numerous local and state health and human service organizations. She received her B.A. from Duke University, her M.S.S.W. from The University of Tennessee at Knoxville, and her Ph.D. from The University of Chicago. She is the co-author of eight, and co-editor of four books, and has published over 30 book chapters and 175 refereed journal articles. Co-authored books include a trilogy with O’Connor published by Wiley: Analyzing Social Policy (2011), Organization Practice (2009), and Comparative Approaches to Program Planning (2008). In her retirement, she continues her writing and provides community service to state, regional, and local agencies that plan for and deliver services to older adults. Peter M. Kettner is Professor Emeritus at Arizona State University School of Social Work. He is author or co-author of six books, four of which have been translated into multiple languages. He has also authored over 50 articles, monographs, and book chapters on the topics of purchase-of-service contracting, privatization, macro practice in social work, human services planning, and social work administration. Over his 30 year career in academia he served as consultant to five different state human service agencies and dozens of local nonprofit agencies on their purchase of service contracting practices and in the design and implementation of effectiveness-based planning systems. In retirement he has continued his writing and consultation with local government and nonprofit agencies. Steven L. McMurtry is a professor in the Helen Bader School of Social Welfare at the University of Wisconsin-Milwaukee. He received his Ph.D. in Social Welfare from the University of Wisconsin-Madison. Prior to assuming his current position he was a member of the faculty at Arizona State University and a Fulbright Research Fellow at the University of Calgary. Early in his career he served as a child welfare worker and evaluator, and he continues to study the movement of children through out-of-home care and retention of staff in child welfare organizations. He is also interested in assessment using brief standardized measures. He currently chairs the Ph.D. program in his school and co-directs a federally funded training program for current and prospective child welfare workers. M. Lori Thomas is an Associate Professor of Social Work at the University of North Carolina at Charlotte and a John A. Hartford Geriatric Social Work Faculty Scholar. She completed her PhD in Social Work at Virginia Commonwealth University in Richmond, Virginia. Her scholarship examines organization, community, and policy practice in homelessness, particularly for older adults and those experiencing serious mental illness and co-occurring disorders. Most recently she completed research examining the housing and health outcomes of a housing first permanent supportive housing model. Lori is also interested in the intersection of religion and social welfare, completing national collaborative research on best practices in faith-based human services and research on faith-based advocacy organizations. Lori has over 15 years of work experience in affordable housing and homeless services.